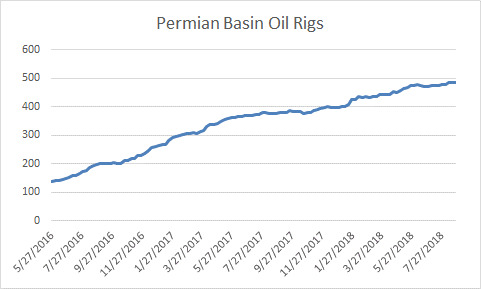 Oil-directed drilling rigs in the Permian Basin continue to rise and are at 485 for the week ending August 24th. This figure is 29 percent higher than a year ago. 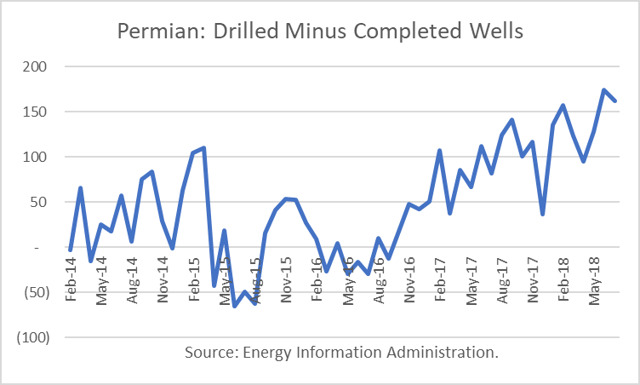 The growth of crude production in the Permian Basin has been very impressive over the past year. Estimated output in September 2018 is expected to be 3.421 million barrels per day (mmbd), an increase of 850,000 b/d, or 33 percent, year-over-year. There is about 3.1 mmbd of pipeline takeaway capacity, 300,000 b/d of local refinery capacity, 300,000 b/d of train capacity and up to 40,000 b/d of truck capacity, according to S&P Global Platts. Much of the train capacity is being used to move frac sand. As a result, “takeaway capacity” limits are being reached. Many more wells have been drilled than completed in recent months. The result has been a rise in the “Drilled But Uncompleted” wells (“DUCs”) count. 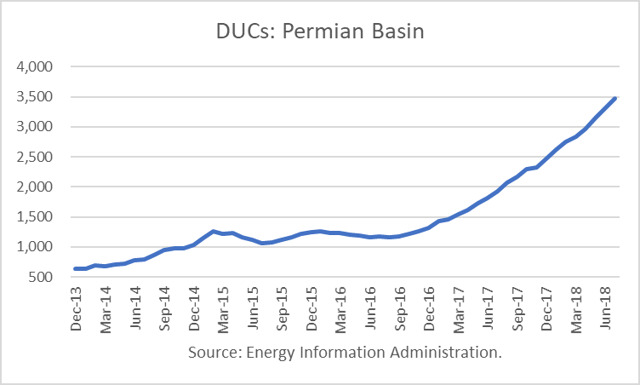 In July 2018, the EIA reported 3,470 DUCs in the Permian, a year-over-year increase of 80 percent. Drillers such as on Pioneer Natural Resources Co. (PXD) plan to focus on more high-intensity completions in the second half of 2018. However, they will not affect actual production until 2019. About 200,000 b/d of capacity is scheduled to be in service during the fourth quarter of 2018 due to the Plains Sunrise expansion. Another 40,000 b /d is scheduled to be available in early 2019 due to the Bridge Tex expansion. The Cactus ll pipeline is slated to bring on 525,000 b/d capacity if the third quarter of 2019, and the 700,000 b/d Gray Oak pipeline should be completed in the fourth quarter of 2019. Epic is bringing on 590,000 b/d in the second half of 2019. Energy Transfer Partners is planning to build 600,000 b/d of pipe in 2020, and more than one million barrels of capacity is scheduled to be completed with no scheduled completion date. In total, just over two million barrels of pipeline capacity will be in place between now and the end of 2019. “The main implication of the massive DUC buildup is the ability to ramp up production quickly when significant takeaway capacity expansion happens in second-half 2019,” Artem Abramov, vice president of shale analysis for Rystad Energy Abramov said. He added that “upside potential is yet to be seen amid significant multi-stack potential yet to be unlocked” in the Permian. 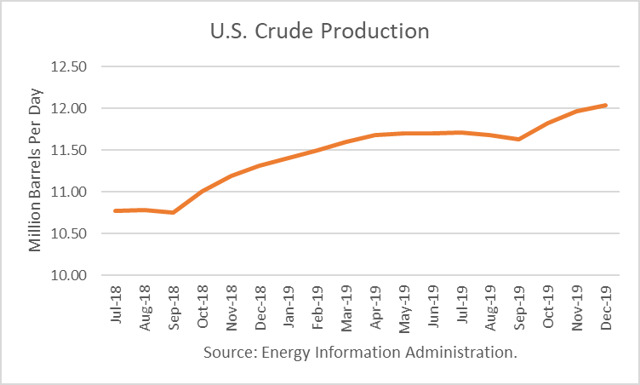 The EIA has forecast that U.S. crude production will rise by one million barrels per day in 2019 to 11.7 mmbd. However, that increase may be far too conservative once Permian’s pipeline constraints are alleviated. 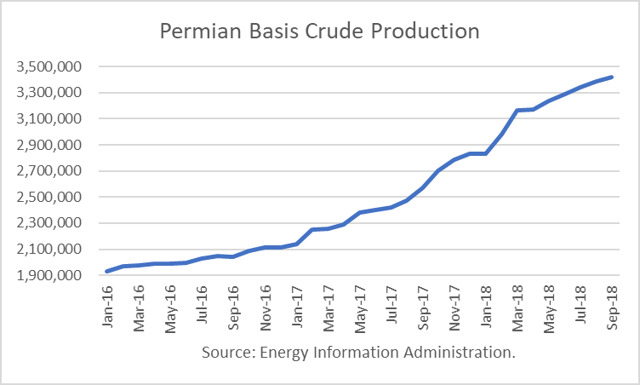 Getting an information about the growth of crude production in the Permian Basin has been very impressive over the past year. Gives the result which has been rise. Thank you for sharing such a useful information about Permian Basin, a growth of crude production which is very useful.